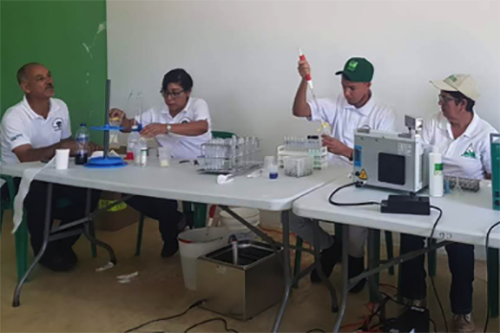 More than 120 milk samples were tested at a SAFE milk analysis lab in San Juan province. In its commitment to improve the quality of Dominican milk and dairy products, NCBA CLUSA, through the U.S. Department of Agriculture-funded Safe Agriculture Food Export (SAFE) Project, is carrying out milk quality monitoring tours around the country. Led by milk quality specialist Mildred Coste, these monitoring tours focus on milk collection centers with known quality problems (receiving Grades C or D) and analyzing samples from each producer supplier to the collection center. Sampling helps to identify irregularities so project experts can tailor training to the producer. 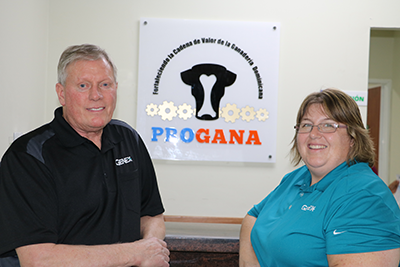 The USDA SAFE Project, known locally as PROGANA, is able to work directly both with the milk collection centers as well as the suppliers, improving quality along the value chain. From the milk centers, the PROGANA project team takes samples to the lab work station. The milk goes through processes to identify if it has been watered down, adulterated or if there are bacteria contaminants. One test, the Methylene Blue Dye Test, shows the amount of bacteria in the milk. Bacteria in the milk absorb the blue dye when it is added, so the faster the milk turns back to white, the more bacteria are in the milk. “A high-quality milk lasts more than five hours changing from blue to white, while a low-quality milk can turn white even within the hour,” Coste explained. One collection center in San Juan had a sample that took less than two hours to turn white, indicating bacterial contaminants. Such a rapid change usually means a lack of hygiene during the milking or transportation process rather than a metabolic or nutritional problems with the cow, Coste said. Pinpointing the problem helps the team to determine what kind of training producers need, and where they can support the milk collection center. Working with the Dominican Agribusiness Board (JAD) and the National Livestock Directorate (DIGEGA), the PROGANA team can tailor technical assistance. Many of the identified problems relate to milking hygiene on the farm and transportation to the milk center. Issues include improperly securing the cow’s tail to avoid flapping dirt into the milking bucket or having the milk handler wear clean clothes and sterilize their hands when milking. The cows’ udders must be cleaned with paper rather than a sponge, which can hide bacteria. Small changes in sanitation can make a huge difference from farm to milk collection center. There are a number of factors that affect the quality of milk, from the animal’s nutrition to the application of medication. It is the responsibility of the dairy farms to ensure that milk production is safe and sustainable. 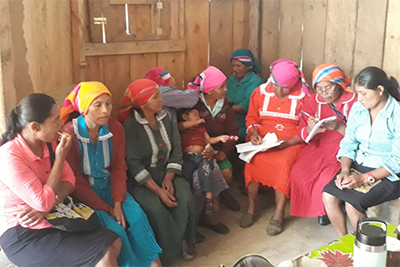 Working with the project’s extension agents, dairy farmers receive training and technical assistance on best practices that encourage a culture of food safety and guarantee the quality of their milk. To facilitate improved milking practices, for example, PROGANA is distributing 2,000 Embrapa kits to dairy farms throughout the country. These kits consist of a hanging bucket with a hose to help wash and keep both the milker and cow clean. The USDA SAFE Project is committed to improving the quality and productivity of the Dominican livestock and dairy sectors. Offering technical assistance from farm to processing plant ensures milk along the value chain translates into quality milk and dairy products for national consumption.